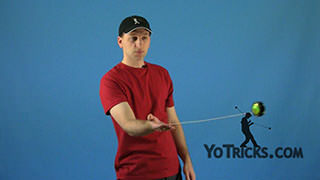 Learn to do the elbow wrap yoyo trick. 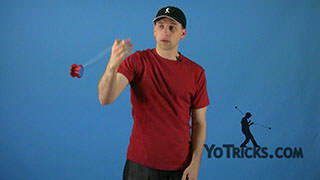 Elbow Wrap Yoyo TrickThis trick is the Elbow Wrap and there are two versions to do it and they look like this. Just like that. 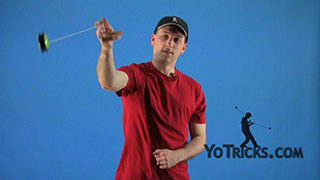 Now with these two versions the first one will be easier to starting learning on and that is if you are throwing with your right hand you are going to turn towards the left, and if you throw the yoyo with the left hand, you are going to turn towards the right. 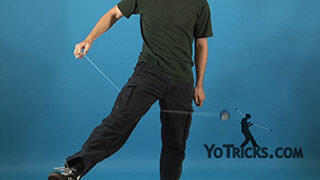 So to start with that, like with any long spin trick that does not have a regeneration it will be good to start practicing with the yoyo not spinning or with it dead. So just let it hang down dead and swing it into a regular around the world as though you are throwing it from a Forward Toss. As you are swinging it around and you want to start the elbow wrap what you are going to do is you are going to pick your elbow up into the air and then have the string draped over top of your upper arm and the string is going to have a particular placement; you want it beneath the shoulder muscle here but still above your bicep muscle here. 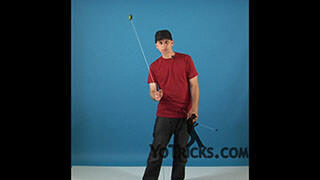 Also in order help yourself be able to perform the trick, you are going to bend your wrist in ninety degrees and then also have your yoyo finger in as close as you can towards where the string is starting to touch your upper arm and that is to decrease the string length right here so that way you have more room and the yoyo will be able to slow down and you will be able to perform the trick more smoothly. 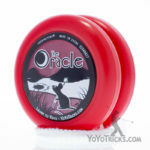 So as the yoyo goes around over the top of your upper arm it is going to come over for a second pass and you are going to want to make sure to tuck in your fingers so that way you have enough clearance so that way the yoyo can come on the inside and you are going to have really tight clearance in-between your fingers and your shoulder so you are going to want to aim the yoyo really well in order to get it around and pass your hand, once it is past your hand you are going to turn your body to the other side and that is going to undo the wrap since the yoyo is going to keep on orbiting in the same direction but you are going to be changing your body orientation so that way it undoes the wrap on the other side. Also when it comes undone on the other side you are going still keep your fingers tucked in right here because you are also going to have the same tight clearance coming out from the other side. So besides the two clearance points the finger is always going to be touching the shoulder almost underneath the bottom of your shoulder muscle and even on the top of your bicep muscle if you can get down that far. It can be really tough to hold this position so you may need to practice your stretching with your hands in order to tuck them in nicely and in order to bend your wrists in enough and so you may even need to walk around holding this awkward position until you feel comfortable with it in order to get the trick. After that it is going to come down to timing and you are going to want to anticipate the timing in order to get the turn right. 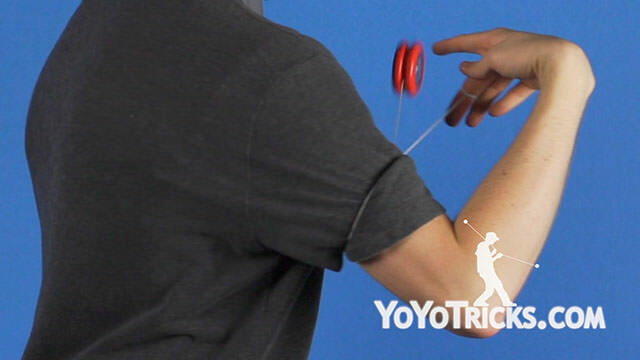 Once the yoyo passes by your hand this is when you should be beginning your turning because once it passes by your hand and then swings down to the bottom here your elbow should already be halfway through the turn by now. Once it hits the bottom, you are then going to continue rotating your shoulders so that way your shoulder are turned 180 degrees and that will allow your elbow to be in place so that way the wrap can come undone and still stay on plane. 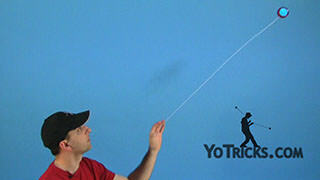 Usually for players they will tend to under rotate and then the yoyo will come off off-plane and that will make the yoyo die in spin. It will be important to make sure your shoulder rotate 180 degrees over the course of the trick and you will want to accelerate your elbow the first ninety degrees really quickly. 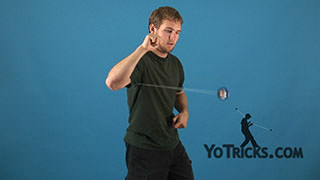 After you get comfortable going in and out of the elbow wrap without it say hitting your elbow or hitting your hip or shoulder, you can then practice the trick with it spinning and this will help you determine whether or not you are getting the full 180 degree action out of your shoulder and your elbow, because if you under rotate you are going to make the yoyo come off plane and it is going to come off crooked or sideways and that will tell you that you have under rotate. 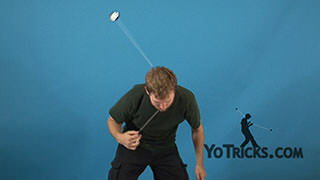 You just want to make sure that when you hit the elbow wrap you are turning completely around and yoyo will come out on the same plane as it was going in. From there, there are going to be a few more tips in order to help you rotate. The first thing is going to be about your feet. For some people you can actually do the trick with your feet planted and just turn your body all the way around and have your shoulders square up completely behind you. For some you may even need to pick up the same foot in which you are doing the elbow wrap and then rotate around in order to get the full 180 degree effect to happen. For some you may want to put your foot forward before you enter the elbow wrap and then rotate on the balls of your feet so way you turn to the other side. The next part to think about is going to be your hips. You are going to want to at least turn them ninety degrees during the elbow wrap though it may be helpful to have your hips follow your shoulders and go the full 180 degrees with them as well. When thinking about all 3 body parts, feet, hips and shoulders, when you are starting to learn the elbow wrap and just getting used to it; it may be helpful to actually pick up the feet turn them 180 and have the hips and shoulder do the full 180 as well, for those that are kind of used to doing and getting in and out without hitting your other body parts, you can pull off the trick by keeping your feet planted, turning your hips ninety degrees and then turning your shoulders 180 degrees there. After we learn the first version of the trick we can now try the second version, what is actually pretty similar to doing the chain wrap trick but we are going to be adding an extra step to the chain wrap. 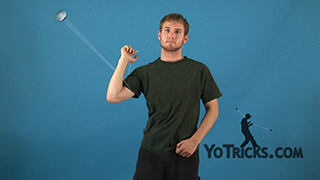 So when we get in our elbow wrap it is going to be the same way was the first version, we are going to drape it over our shoulder, same place, have our hand touched in the same way, but instead of rotating towards your opposite side you are going to be rotating towards your yoyo side as you do the trick. What you are going to do is you are going to move your elbow towards your outside, but not too quickly right away because you want the yoyo to come past your yoyo hand and inside your shoulder first so that way it will make a full wrap around your arm and then come out. 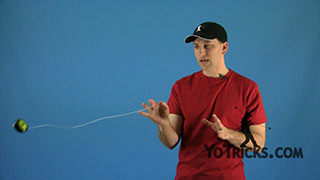 If you do not actually get the string past your hand and your shoulder, it is actually just going to undo itself in one wrap and it is only going to bend around your shoulder rather than the full wrap around your shoulder like so. After you have gotten it past your hand, you can then start accelerating your elbow really quickly and then getting out of the trick just to make sure it does not hit your hip here and after you have gotten all that down and you can hit it spinning as well, and you also get the plane down as well, then you can also do the trick with your opposite hand and learn the two versions of it there as well and that is the elbow wrap.